Join a choir. Science shows it’ll make you feel better. This essay is adapted from Imperfect Harmony: Finding Happiness While Singing With Others by Stacy Horn, out now from Algonquin Books. I used to think choir singing was only was for nerds and church people. Since I was neither, I never considered singing in a group—even though I loved singing by myself. Then, in my 20s, I found myself facing a big, black hole of depression. I remembered how much fun I had once singing Christmas carols with a boyfriend at his church. Desperation forced my hand. I joined a community choir. Except that at that first performance, we didn’t sing Christmas carols—we sang a piece of music that was 230 pages long: Handel’s Messiah. It was magnificent. I was left vibrating with a wondrous sense of musical rapport. Since that performance, I haven’t found the sorrow that couldn’t be at least somewhat alleviated, or the joy that couldn’t be made even greater, by singing. Singing is such a surefire way of feeling good that even singing about death is life-enhancing, which is fortunate, because if you sing in a choir, you’re going to be singing about death. A lot. Typically, every spring, choirs all around the world will sing the Requiem Mass, a mass for the dead which has been set to music by many of our greatest composers. But despite all that death, singing requiems is emotionally heartening, and you get a real physical rush. That’s because when I get up and sing the cheery words—“Dies illa, dies iræ, calamitátis et misériæ, dies magna et amára valde” (“That day, day of wrath, calamity, and misery, day of great and exceeding bitterness”)—my brain supplies in perfect combination some of the best opiates and stimulants it has evolved to dispense. Ohio State music professor David Huron believes singing may generate prolactin, which is released in nursing women, and in tears of sorrow. Prolactin has a tranquilizing, consoling effect, and this is why sad music makes us feel better, according to Huron. 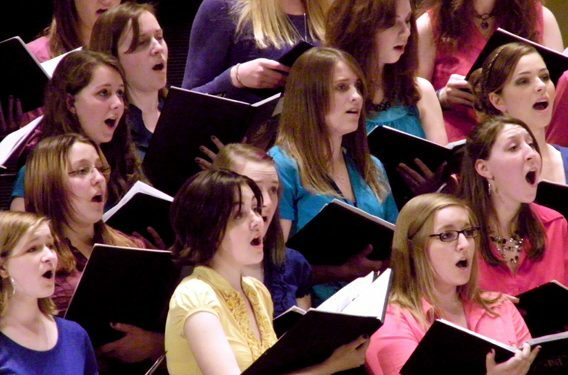 There’s even evidence that singing about death not only feels good, it’s good for you. Researchers discovered that a choir singing Mozart’s Requiem showed an increase in s-IgA, an immunoglobulin that enhances our immune defense. It doesn’t even matter if you can sing well. I can’t. The best I can manage is singing in tune. Most of the time. Hopefully. One of my main goals in our weekly rehearsals is not being heard. Over the years I’ve become a master in the art of voice camouflage, perfecting a cunning combination of seat choice, head tilt, and volume. Luckily, in a 2005 study, investigators found that group singers experienced the same benefits even when “the sound produced by the vocal instrument is of mediocre quality.” It’s arguable whether my vocal instrument even reaches that level, but I’m happy to reap the benefits nonetheless. While any singing has rewards, there are reasons you should find a choir rather than simply singing in the shower and leaving it at that. Studies have found that group singing releases oxytocin, a chemical that manages anxiety and stress and, according to McGill University professor Daniel Levitin, enhances feelings of trust and bonding. That bond, that connection, has seen me through the end of every romantic relationship in my adult life (because apparently my lifelong work on singing hasn’t done a thing for my boyfriend-selecting skills). It has gotten me through the deaths of my mother, some of my closest friends, and finally, my pets. I wonder how Brahms would feel knowing that his German Requiem, so powerful and yet so gentle, never fails to evoke my long-dead cat. Whether it’s a combination of prolactin and oxytocin, or some yet to be discovered neurochemical release, singing takes me to a place where what I thought was intolerable, like death, is somehow OK, which is insane, but there it is. I’m convinced the answer will be found in the study of harmony. Because the world doesn’t open up into a million shimmering dimensions of hope and possibility when I sing alone, or even with other people in unison. It happens when I’m surrounded by my fellow choristers, and all the different sounds we’re making combine to leave us thrumming in harmony—lit up together like fireflies flashing in synchrony by whatever masterpiece is currently racing through our brains, bodies, and hearts. After a recent meta-analysis of 400 music studies, Daniel Levitin pointed out design flaws in some of the experiments, and lack of proper controls, and warned against exaggerating what has actually been demonstrated. A lot of work is left to be done in the study of how the body and brain respond to music and singing in groups. In the meantime, as science works to explain what every singer already knows, no matter where you fall on the voice suckage scale—sing. I know of no other activity that gives so much and is this eminently affordable and accessible: Just show up for choir practice. Singing might be our most perfect drug; the ultimate mood regulator, lowering rates of anxiety, depression and loneliness, while at the same time amplifying happiness and joy, with no discernible, unpleasant side effects. The nerds and the church people had it right. "I've always wanted to sing alto. Vocalize has given me the chance to do it in a very supportive way. It's been great." "Being part of Vocalize has been helpful in more ways than you can imagine; good laughs, beautiful (mostly) harmonies, concentration, memory, better breathing, and most importantly interacting with nice people."